Two recent high profile events, Pakistan’s Super Cricket League (PSL) final and the Lahore Literary Festival, reflect the country’s struggle with the rise of militant Sunni Muslim ultra-conservatism. They also illustrate how militancy often serves illiberal Pakistani leaders as a tool to curtail critical expression much like Western populists such as US President Donald J. Trump seek to redefine truth and refocus public debate. In much the same way that Mr. Trump has declared mainstream media an enemy of the people, Pakistani authorities like their illiberal or autocratic counterparts in countries like Turkey, Egypt, France, the Netherlands, and Germany seem bent on discrediting if not intimidating independent, critical voices. They represent a class of leaders who reflect the increased popularity of religiously-inspired ultra-conservatism, supremacist concepts of civilization, and hyper-nationalism that they exploit to achieve or retain power. That may be nowhere more true than in Pakistan, a country where Sunni Muslim ultra-conservatism has with the help of powerful branches of the Pakistani state and Saudi Arabia been woven into the fabric of significant segments of society and government. 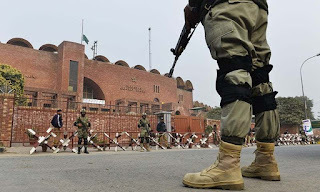 Hosting the PSL final on Pakistani soil at an estimated security cost of $5 million was as much designed to prove that the country can organize domestic and international matches without incidents of political violence as it was to project a different image of Pakistan. In terms of ability to secure a venue, Sunday’s match proved the point. Thousands attended the game that went off peacefully weeks after a militant bombing campaign that targeted government and minorities. The final was played in Lahore’s Gaddafi Stadium, one of the world’s largest cricket fields that still bears the name of one of the Muslim world’s more controversial leaders six years after Libya’s Col. Moammar Gaddafi was ousted by a popular revolt. The match was the second PSL match to be played in Pakistan rather than the UAE, the country’s alternative home base, since an attack in 2009 on a visiting Sri Lankan team. Seven policemen were killed and seven cricketers injured in the attack. 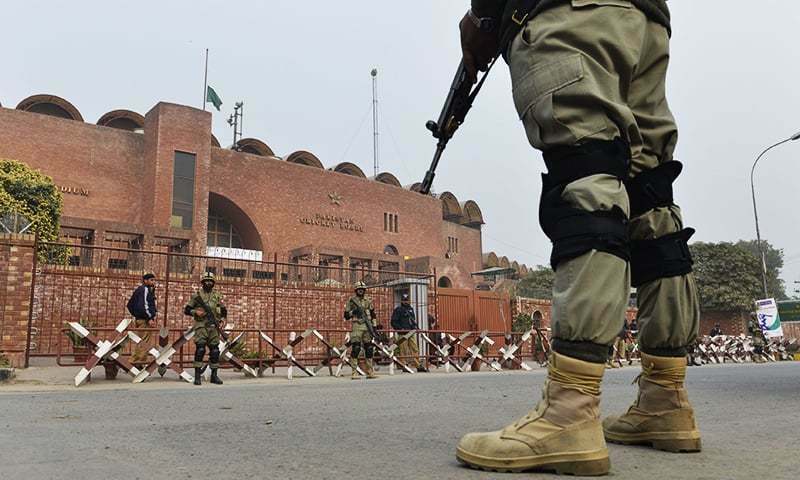 Pakistan’s initial effort to test the ground in 2015 failed when a suicide bomber blew himself up at the gate of Gaddafi Stadium during a match against Zimbabwe. The question is whether the absence of an incident will persuade regulators and teams that security in Pakistan has been restored. Scores were killed in militant attacks across Pakistan in February. Gaddafi Stadium was turned into a fortress for the PSL final. Thousands of security troops accompanied by 1,000 sniffing dogs surrounded the stadium and thousands more were deployed in areas around the city. The stadium’s shops and restaurants as well as nearby roads, mosques and wedding halls were forced to close. Spectators were bussed to the stadium from a parking area four kilometres away. Five of the ten foreign players playing for the Quetta Gladiators and Peshawar Zalmi refused to play on Pakistani soil. The remaining five were reportedly payed an extra $10,000 for the match and were those that are less known internationally. To be sure, the successful match proved wrong Pakistani cricketer-turned politician Imran Khan who described the decision to host the match in Lahore as "madness” even if it will likely take a lot more to restore confidence in Pakistan as a secure cricket ground. Yet, the length to which the government was willing to go to project Pakistan as safe for cricket juxtaposed with the government’s reduced enthusiasm to ensure normalcy for Lahore’s acclaimed literary festival, a platform for international and local critical voices, raises a host of questions. This year’s Lahore Literary Festival, founded to celebrate the city’s 900-year history as an outward looking cradle of Punjabi culture, was moved from the Al-Hamra Open Air Theater to Faletti’s Hotel, an ornate, upscale compound hidden behind walls, security barriers and elaborate checks of vehicles and visitors. Critics charged that ultra-conservative violence served to restrict critical voices. “When it comes to entertainment, the government of Punjab tends to instantly dub anything ‘insecure’... Bomb or no bomb, if the public was ready to come out and attend the festival, the government should have taken a stand and protected the area,” thundered Pakistani columnist Xari Jalil in an op-ed in Dawn newspaper. The questioning of five bloggers critical of the military, and in some cases critical of religion, who were apparently kidnapped in January by elements of the security establishment and held incommunicado for three weeks, reflected the degree to which ultra-conservatism, hyper-nationalism and a conspiratorial view of the world had become part of their interrogators’ DNA. That is true even if the incident turned out to be a bungled attempt to muzzle the bloggers that backfired amid international and domestic criticism. The kidnappings may have silenced the bloggers but energized proponents of freedom of expression. Major General Asif Ghafoor, head of the public relations department of Pakistani intelligence, denied this week that security services had been responsible for the detention of the bloggers. “The interior minister never hinted at involvement of intelligence agencies while talking about issue of disappearance of bloggers,” Ghafoor told journalists. Held in a detention facility filled with ultra-conservative militants, a guard told the bloggers: “You are more dangerous than these terrorists. They kill 50 or 100 people in a single blast, you kill 600,000 people a day,” a reference to the 600,000 clicks on the bloggers’ Facebook page on peak days. While in detention, the bloggers were pressured to perform Islam’s obligatory five prayers a day. Reluctance to do so served as evidence that they were not really Muslims and agents of the Research and Analysis Wing (RAW), India’s primary foreign intelligence agency. The suggestion that some of the bloggers may have been atheists was beyond their interrogator’s conceptual framework. Leaked reports in the Pakistani media and complaints filed with the police and the courts by pro-military ultra-conservative activists accused the bloggers of having violated Pakistan’s draconic blasphemy laws, a bid to dampen criticism of their disappearance. “You will be dead men walking,” a guard told the bloggers as they were being released. Threatened by unidentified persons and neighbours alike, some of the bloggers’ family have been forced into hiding. Critical voices remain prominent in Pakistan’s freewheeling media much like mainstream US media counter Mr. Trump’s ferocious assault with thorough, investigative reporting. In both Pakistan and the United States the battle is one for the definition of truth between on the one hand religious conservatives, hyper-nationalists, and opportunistic politicians and on the other investigative media and proponents of more open societies. It is a battle that likely will shape society for some time to come.